Illustrated with 77 spectacular color photographs, this comprehensive guide treats readers to an up-close-and-personal view of more than 50 fascinating sites on both sides of the border. Visit picturesque canals, stately mansions, wineries, canals, waterfalls and forests. Learn about the region's unique history, geology, flora and fauna. Complete with color maps, Exploring Niagara suggests tours within a half hour's drive from Niagara Falls. Authors Hans and Allyson Tammemagi have tailored their user-friendly book to a variety of interests. 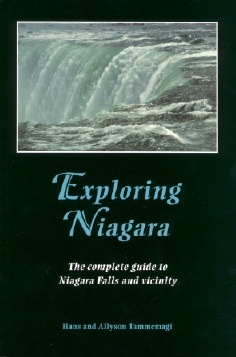 Buffalo News reporter Mike Vogel said Exploring Niagara is a book "for those with an eye for nature and history, but there's also a good listing of festivals, re-enactments and annual community events." This fact-based guidebook is the perfect companion for exploring the region and also makes a wonderful gift.